While youâ€™re planning your visit, make sure you schedule time to stop by Vinpowerâ€™s booth located in the South Hall, booth # SL8724 to see our latest line of duplicator hardware and media offerings. Until then, feel free to contact one of our regional offices about our current product line and where you can purchase for your location. When youâ€™re producing digital material onto discs, whether as a service or for yourself, having a nice printed image will always make the presentation a 100 times better. For those that use an inkjet printer, the benefits are that itâ€™s less expensive, quick, and easy to use. However, the drawbacks are that the printed image is generally flat and not resistant to moisture or scratches, which could ruin your work of art. The solution is using a special glossy water and scratch resistant disc, like the Liquid Defense Plus, from Vinpower Digital. 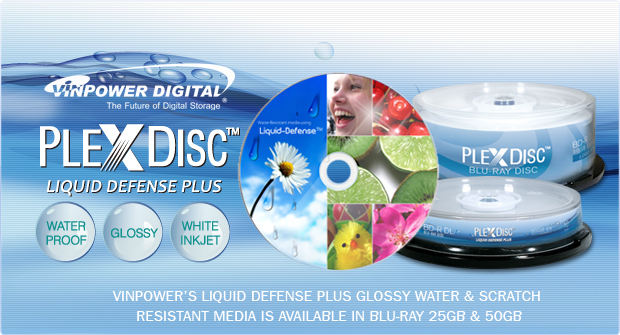 If youâ€™re using CD or DVDâ€™s, then you have a small handful of choices, but when you want a disc with more capacity, like Blu-ray, then the Liquid Defense Plus is the only solution. So donâ€™t limit your opportunities by producing only DVD content when you could be getting a higher premium for Blu-ray. The competition for CD and DVD production is so tight, that the ROI is a lot less, whereas Blu-ray is the next frontier and thereâ€™s a lot more margin and opportunity. So if you really want to make an impression, start with the inkjet printable media that will not let you down, Liquid Defense Plus from Vinpower Digital, available in CD, DVD, and Blu-ray! Contact your Vinpower representative for more details about the Liquid Defense Plus line of Glossy, Water & Scratch Resistant Media. Do you know the difference between DVD-R and DVD+R? 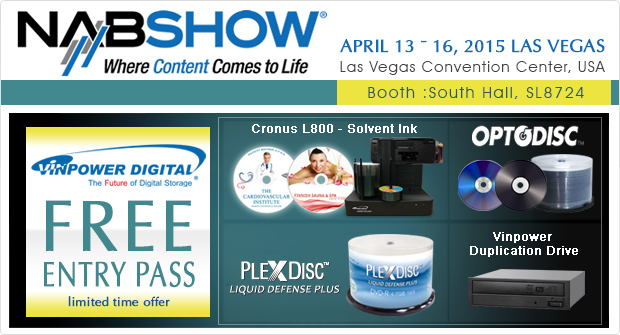 Most people donâ€™t realize there are two types of recordable DVD media to choose from. Itâ€™s not surprising, as most of the time when there are two competing formats vying for the same market, i.e. VHS vs. Beta or HD DVD vs. Blu-ray, one format ultimately dominates and the other quietly fades from existence and becomes a cautionary tale for future technology battles. But the case of the recordable DVD is different in that both competing factions have not only survived, but look to remain viable options long into the future. The 4.7GB recordable DVD-R and DVD+R formats are fairly similar, but there some distinct differences between the two. The DVD-R was the first recordable DVD format, developed by Pioneer in 1997. The popularity for DVD-R media was immediate and in 2002, a competing faction of companies developed an alternative recordable DVD, branding it as DVD+R media. Initially DVD-R was more compatible with DVD players and so the DVD-R format was the preferred choice for those copying video content. However, the DVD+R format was recognized as a more stable and reliable recordable media format and thus became the preferred choice for those storing data. Eventually, all DVD drive and player manufacturers recognized the merit of both formats and made sure all of their players and products supported both formats. Today, DVD+R is just as compatible with recordable drives and player as DVD-R, but itâ€™s technological benefits make it a better solution. In fact, the DVD+R format uses a number of improved technologies that, while generally unnoticeable to the end user, make a more reliable technology. One example is the ADIP (ADdress In Pregroove) system of tracking and speed control used by DVD+R being less susceptible to interference and error than the LPP (Land Pre Pit) system used by DVD-R, which makes the ADIP system more accurate at higher speeds. In addition, DVD+R(W) has a more robust error management system than DVD-R(W), allowing for more accurate writing to media independent of the quality of the media. Additional session linking methods are more accurate with DVD+R(W) versus DVD-R(W), resulting in fewer damaged or unusable discs due to buffer under-run and multi-session discs with fewer PI/PO errors*. So if you want a recordable DVD that you can burn faster, lasts longer, and is more accurate, the DVD+R media format is the superior choice. For more details about any form of recordable digital media or hardware, contact your Vinpower representative today.